Without knowing emission spectra i remain skeptical of all such limits. (I remain skeptical of all purported Lorentz violations also). Thanks for the update and the sharing of your thoughts related to this renewed analysis. In the end though I like you still don’t know quite what to make of all this; except perhaps other than to wonder if Michelson and Morley had any idea what a controversy they would have begun. Then again I must say I’m encouraged that observation is beginning to have an effect as to be paid to attention again to help shape theory instead of the other way around. However, that would only be echoing the sentiments of someone much wiser who pleaded for the same long ago and thus wonder as to how it came to take so long to have heard. "You are the only person with whom I am actually willing to come to terms. Almost all the other fellows do not look from the facts to the theory but from the theory to the facts; they cannot extricate themselves from a once accepted conceptual net, but only flop about in it in a grotesque way." Putting limits on energetic values helps in order to see "potential measures" against backdrops here on earth? 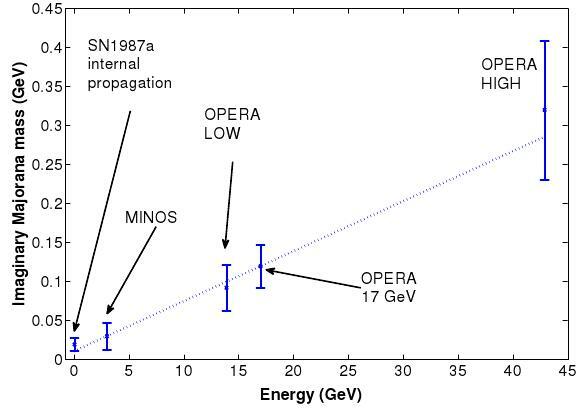 Not only constraints on energetic values of photon to event, but on Fermi Calorimeter indication as to what can be measured in IceCube/Opera results. Is there a correlation then from events identified GRB emissions and events in IceCube/Opera? Those four events reveal that underlying structure? This is still important with regard to GZK upper limit? This is all connect to GRB event? Lorentz invariance fails if the vacuum is anisotropic. The vacuum has no detectable photon refraction, dispersion, dichroism, or gyroptropy to a heroic number of decimal places, arxiv:0912.5057, 0905.1929, 0706.2031, 1106.1068. Evidence of hard gamma dispersion suffers from questionable statistics, method and sample size, as stated. If massless probes detect no vacuum anisotropy, use massed probes. Massed probes rigorously derive from crystallography, are dense, and are cleanly contained over long measurement intervals. The vacuum can be anisotropic toward mass starting ~10^(-9) relative, and below 10^(-12) relative without constraint. Detection sensitivity ~10^(-15) relative. If the vacuum is a left foot toward mass, then opposite shoes fit with different energies. If opposite shoes vacuum free fall, then their minimum action trajectories diverge - a geometric parity Eotvos experiment opposing chemically and macroscopically identical, crystallographically enantiomorphic single crystal test masses. Look under the bas de caisse to find the connection. If massless probes detect no vacuum anisotropy, use massed probes. Massed probes rigorously derive from crystallography, are dense, and are cleanly contained over long measurement intervals. The vacuum can be anisotropic toward mass starting around 10^(-9) relative, and below 10^(-12) relative without constraint. Detection sensitivity snugs 10^(-15) relative. If the vacuum is a left foot toward mass, then opposite shoes fit with different energies. If opposite shoes vacuum free fall, their minimum action trajectories diverge (geometric parity Eotvos experiment). If the observational results confict with one's theoretical preconceptions, then one just hand-waves furiously and concludes that the observations are not conclusive. More observations are requested until some fluke appears to support one's theoretical preconceptions. Then one claims the desired result is empirically proven. I was just tweaking the noses of those who insist that spacetime becomes foam-like, or spagetti-like, or whatever, in the microcosm. They appear to have no intention of taking "no" for an answer. If we are ever to have a viable quantum gravity theory, we are going to have to understand gravitation in the microcosm. Since this will require a major revision of assumptions, it will require a major empirical jolt to overcome the theoretical inertia. As I explained here before some time, the comparison of speed of visible light and gamma ray photons could be misleading, because these two thingies tend to revolve mutually during their travel at cosmic distances, so you'll always find a smaller difference in speed, then it really exists inside of such system.